Soda? Why bother drinking regular soda on Halloween when you can just apply one of these Halloween Slapsticker Soda Bottle Labels and convert any two-liter bottle of soda into a perfectly spooky liquid refreshment fit for ghosts, ghouls and monsters. Each pack of labels is sold as a set of four, which ensures that you get each clever label. 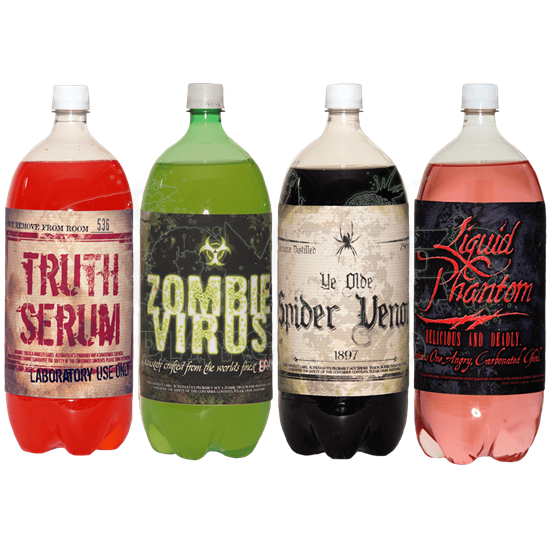 You will get a label for bottled zombie virus, which is exquisitely crafted from the worlds finest brains! You will get a label for truth serum, which should not have been removed from room 526 and is for laboratory use only. You will get a label for genuine distilled ye olde spider venom (distilled since 1897). And finally, you will get a label for liquid phantom, a delicious and deadly beverage that contains one angry, carbonated ghoul. Each label comes as a sticker so it can easily be applied to any two-liter bottle of appropriate size. During your next Halloween party, do not hide your soda bottles. Display them openly after applying a few of these Halloween Slapsticker Soda Bottle Labels, and show your guests that they are drinking authentic Halloween beverages!